The concert I have been waiting a year, and in some ways nearly a lifetime for is just 24 hours away. 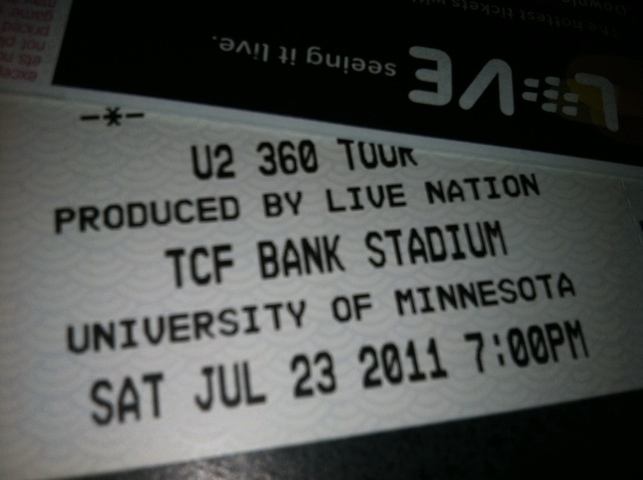 Despite horrible traffic predictions and the possibility of severe weather, I can not wait to see U2 at TCF Bank Stadium in Minneapolis. I’m some what in the nose bleed section, but I will be close enough to enjoy the action and sing along to one of my all time favorite bands. Saw Oasis with guests Ryan Adams and The Cardinals on Wednesday. This marked my sixth Oasis show and second Ryan Adams set. I’m a huge fan of Oasis and a long time fan of Ryan Adams so this was kind of a dream show. Oasis seemed pretty loose on stage, I’ve seen them a lost stiffer in the past but the set went well and Noel seemed to be having a good time (if not in Minneapolis in general, but at the show at least). The band also played a few songs I haven’t heard them play, at least not for a long time. The Masterplan, Slide Away and I Am the Walrus were all pulled out and let breath. The nights version of Wonderwall and Don’t Look Back in Anger were both different from what I’ve heard them do in the past, so it was nice to see those tracks get a refresher. Ryan Adams put on a good “hits” style set, without playing “NY” which surprised me, but as someone who doesn’t get to see him that often it was nice to hear some of the songs he did play. Matt Costa opened the show. I like his stuff, but his acoustic style doesn’t fit the Target Center well. I’d like to see him again at a smaller venue like the Varsity. I just wanted to post a quick note about the Oasis concert at the Target Center in Minneapolis. If you’re going to be there Wednesday, send me an e-mail. I’m going with a friend and it would be cool to meet up with some other Oasis fans.